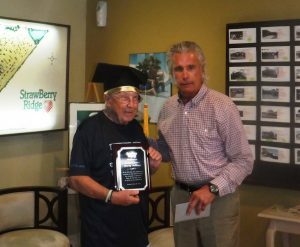 Valrico, Fla. (June 20, 2017) – After leaving high school early some 64 years ago to enlist in the Navy, StrawBerry Ridge resident Marty Sullivan earns his diploma. A proud American and Korean War Veteran, Marty Sullivan enjoys quality time volunteering at the Rear Admiral LeRoy Collins Jr. Veterans Museum inside Hillsborough County’s Veterans Park. Here is where Sullivan learned about the high school diploma program being offered to any eligible, honorably discharged military veteran who left school early to enlist in the military. All Sullivan needed to do was complete some paperwork, which is exactly what he did. He proceeded to become the first veteran to walk with and receive his diploma with a graduating class … Newsome High School (Lithia, Fla.), Class of 2017. President of Blair Group Communities and owner of StrawBerry Ridge 55+ Community, Bob Young, honored Sullivan’s achievement with a plaque presented during Sullivan’s graduation party with fellow residents and staff members [Sullivan and Young pictured at left]. Read more about Marty Sullivan’s story, which was featured in the The Ledger, by clicking here, and watch the video featured on ABC Action News Tampa Bay, by clicking here.